As the original light hovercraft manufacturer, we at Neoteric value our 40-year reputation for serving our customers with honesty, integrity and a genuine interest in helping you maintain your hovercraft for economic, dependable and long-life operation. 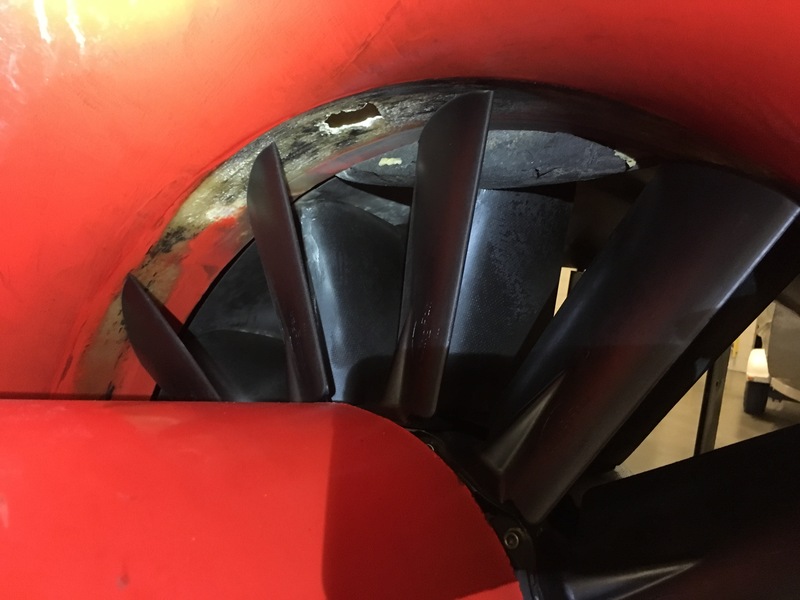 Since we will never allow public image to take priority over customer satisfaction and safety, we will not hesitate to make you aware of even the most minor issues with our hovercraft. In this spirit, please be assured that we will publicize here any issue reported by our customers or learned through continual research and testing by Neoteric engineers, and will provide maintenance instructions to prevent the issue from affecting your hovercraft. Below you will find Service Bulletins for inspections Neoteric currently recommends as a part of your routine maintenance. Click each recommendation below for complete instructions and photos. Multi-wing fans with taper lock bushings, used on the Hovertrek™ hovercraft, should be inspected for cracks in the aluminum hubs. On occasion, these have been found to occur after 75 hours of service. The hubs can be viewed through the gap behind the spinner. More detailed inspection requires the removal of the thrust duct. These images illustrate examples of cracking. Contact Neoteric with any questions you may have. We would appreciate photos if you encounter this or any other issues with your hovercraft. Click to see the images. Correct placement and tightness of hose clamps should be maintained. Fan failures can result from untightened air filter boxes which can vibrate off and enter the fan. Check hose clamps for proper placement and tightness. An incident has been reported from a Korean fire department that operates their rescue hovercraft in saltwater. Corrosion appears to be the culprit. Galvanic corrosion occurred between the aluminum rivet head and the chrome-plated steel cap fitted to the end of the air filter. If one rivet head fails, the rivet head and washer may enter the engine, resulting in the destruction of the engine. Neoteric strongly recommends frequent inspection of the air box as a preventative measure. These images illustrate the damage. If both rivet heads fail, a fiberglass air box cover can be released and sucked into the fan, causing significant damage. Neoteric recommends that all craft owners drill a 3/16" [5mm] hole in the forward edge of the air box flange and use two wire ties (the same as used for skirt attachment) to secure the air box to the wire tie looped through the spark plug coil. Neoteric is currently researching all options for a long-term fix. When developed and tested, the fix will be posted here . A report has been received of loose rivets in the engine air intake box which hold the air filters. The rivets had become worn from vibration. If failure occurs, the rivet steel mandrel head and washers can enter and damage the hovercraft's engine. Inspect the rivets to assure they are secure; if the rivets are loose, tighten them by hammering. 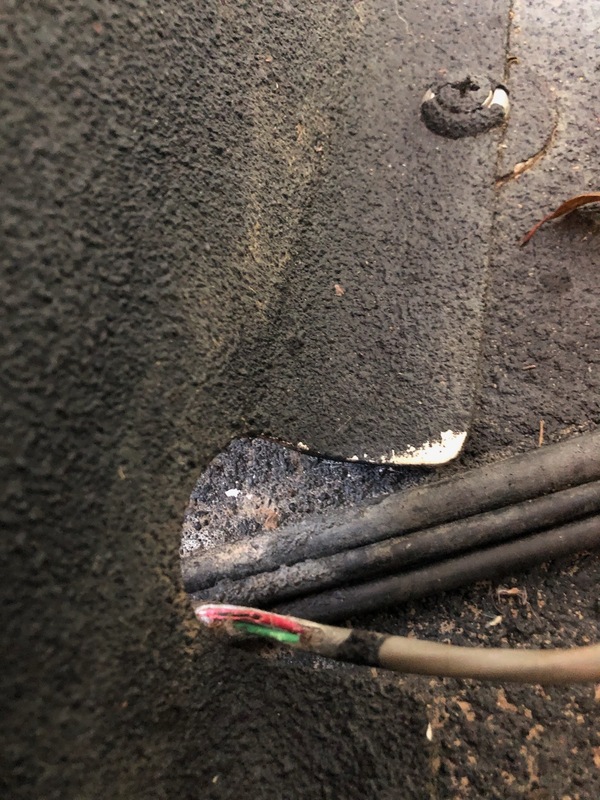 Two customers have reported that the battery cable ground wire can break where it attaches to the engine. 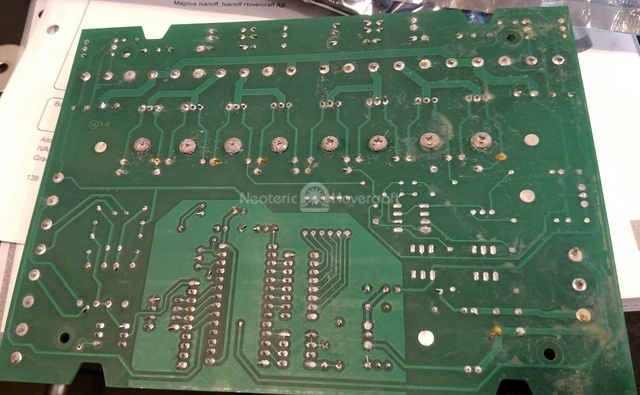 The battery ground cable and terminal end on your hovercraft should be inspected for cracks. 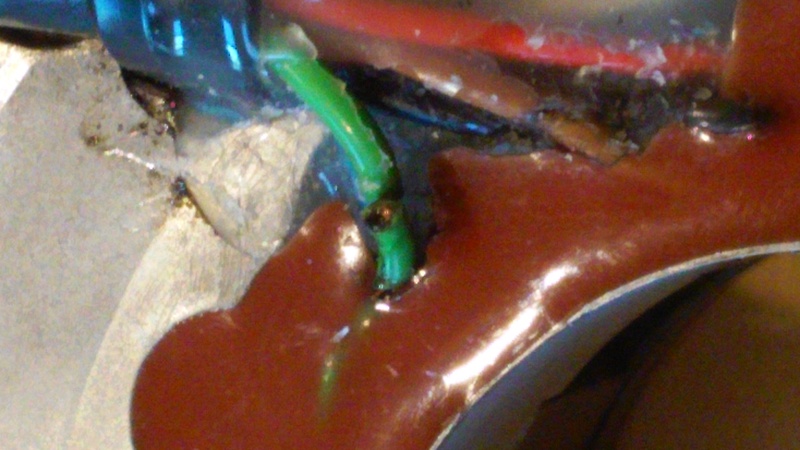 If this cable should break, it could possibly result in electrical damage to the voltage regulator, reverse thrust computer, and other electronics/instruments. We recommend that the Y manifold nuts on our hovercraft powered by Fuji engines be inspected to ensure that they are tight. If you should discover that any are loose, contact Neoteric for further instructions. We would appreciate photos if you encounter this or any other issues with your hovercraft. A few cases of reverse thrust bucket actuator failure have occurred after approximately 18 months and 50 hours of service. Intensive research has revealed that the issue is caused by ingestion of water and fine particulate matter into the actuator via the push rod seal. These ingestions could be especially damaging to hovercraft operating in saltwater. We ask you to contact us about any experiences of actuator misbehavior such as uncommanded deployment, rough or noisy operation, judder on deployment, clutch or push rod seizure and we will reply immediately with instructions for remedial actions. Cracks can occur in the engine mounts after 75 hours of operation. These images illustrate the location and crack. To prevent this issue, inspect the horizontal support closest to the fan. Cracks usually appear adjacent to the weld zone. 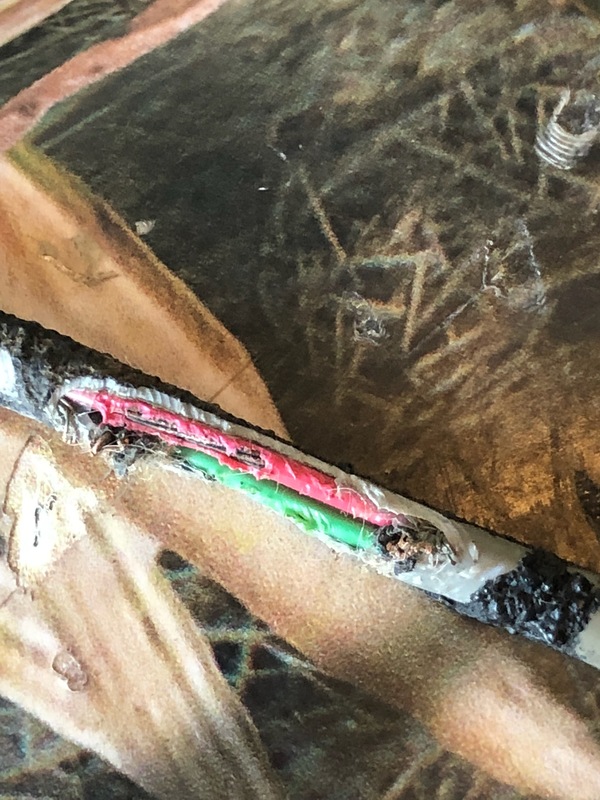 If repairs are in order, weld using TIG and 1/16 stainless steel weld wire. On 100 hp engines, operating in sandy or dusty conditions plus water spray may cause the water pump drive belt to lose tension and fail to drive the pump adequately. If the belt becomes wet due to water spray and there is sand or dust grit present, even minor slippage between belt and pulley can quickly grind the metal surfaces, resulting in complete loss of drive tension. To minimize slippage, the drive belt must be tight at all times and regular checks are essential. As a field guide to correct tension, if the water pump pulley can be rotated by hand and the engine and hovercraft fan turn, then the tension is satisfactory. If the pulley slips it must be tightened. If the belt tension range adjustment has been exceeded, the belt and both sprockets must be replaced. Throttle and rudder cables can freeze if water is inside the cables. Cable end caps are not watertight thus water can enter the cable during high-spray conditions, washdown or if any cable end is submerged. 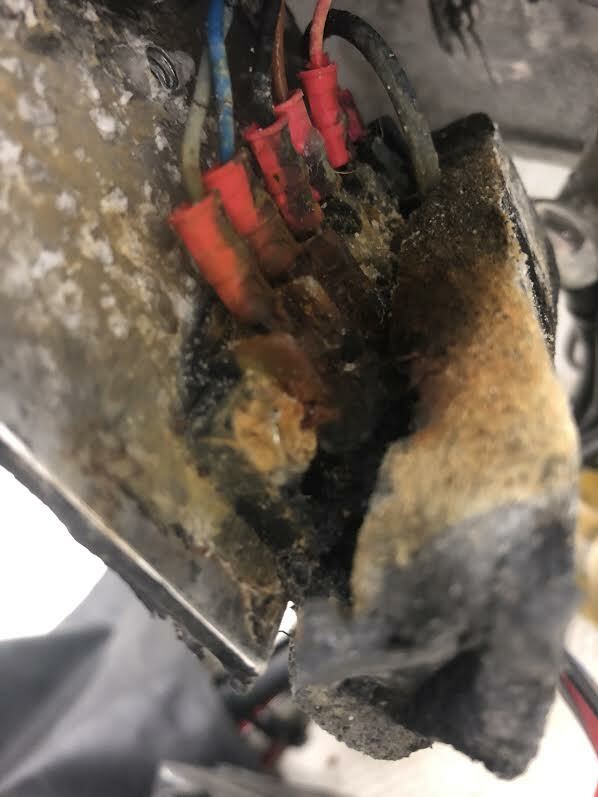 Any atmospheric condition where warm, moist air (high humidity) enters the cable, followed by freezing operating temperatures can also result in condensation and subsequent cable freezing and lock-up. One solution to cable freezing is to force antifreeze through one end of the cable until it dribbles out the other. This must be done when any water that might be inside the cable is liquid, i.e. it’s best done in a warm environment. Moving the cable back and forth while filling also aids the process. The antifreeze will evaporate over time and will get pumped out of the cable due to movement of the cable, so this process should be repeated from time to time depending on the severity of the freezing conditions and how frequently the cable is operated. I Remember that many (Glycol) antifreeze solutions are messy, toxic and can promote corrosion so should be treated with caution (use gloves and clean up spills). Neoteric has been experimenting with Glycerin (Glycerol) as a less toxic and longer-lasting antifreeze. 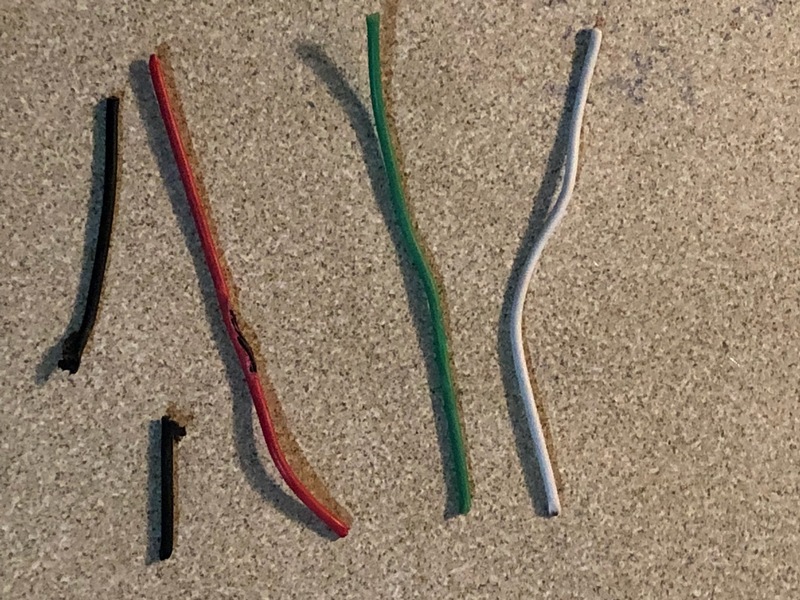 Although a 67% Glycerin/water mix by weight will not freeze until around -52 degrees F, its viscosity is very high at this point so we are experimenting with a 50-50 mix which should not freeze at -5 degrees F while the viscosity is at acceptable levels to allow normal cable operations. It is advised during the 300 hour inpsection of the transmission that the drive belt be removed and the rear fan shaft bearing and fan shaft are checked for wear. If there is looseness between the shaft and bearing both should be replaced. The importance of enclosing the reverse thrust computer in a waterproof metal box (Faraday cage) cannot be overemphasized. If moisture enters inside the box it can destroy the computer or cause erratic operation. Use a polysulfide caulking material to ensure that the enclosure is properly sealed. Static electricity on a stalled actuator can generate a high voltage spike which can destroy the MOSFETs (small black squares). Eventually the MOSFET will fail completely; thin board shows the extent of a serious meltdown. The problem can also be the result of using jumper loads to start the engine. This is a failure of a 100 HP engine magneto. 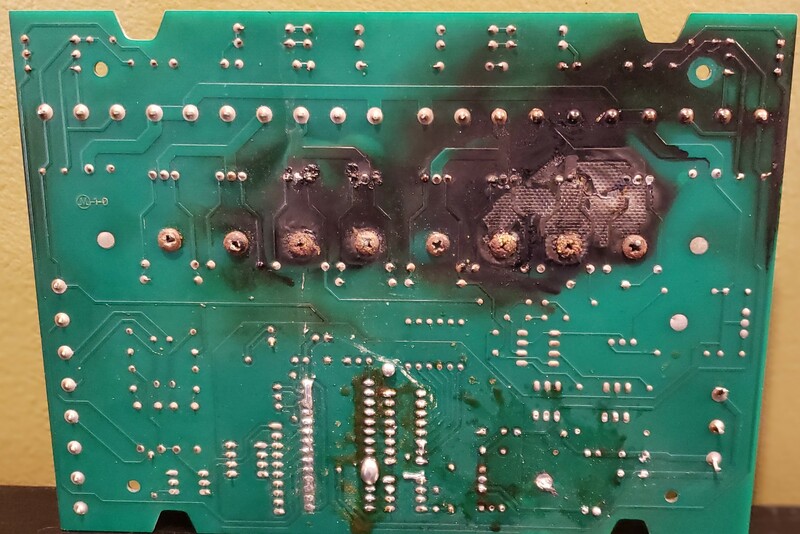 The cause is still completely unknown but is suspected to be caused by battery jumping. 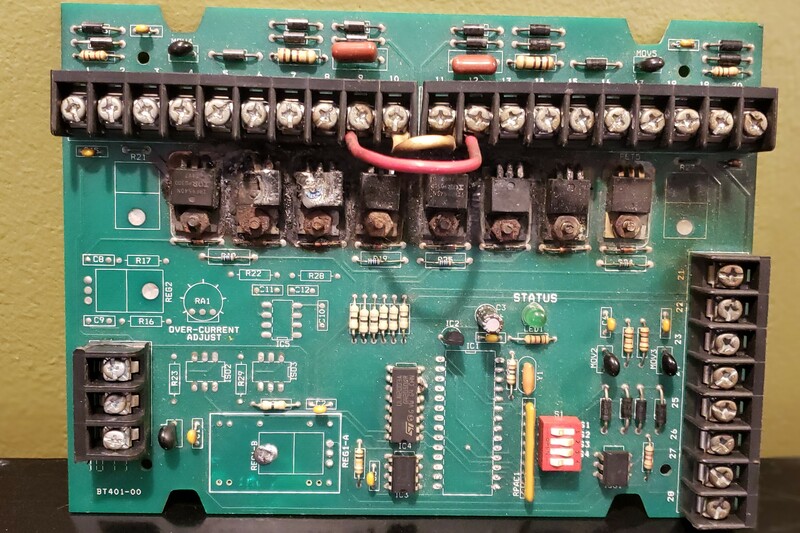 Failure mode is unknown but could be internal diode component failure creating a dead short and battery feeding high amperage back through the regulator. This style of regulator is no longer used. In use now is a three phase voltage regulator of much higher efficiency. It also has a metal case so this type of burnout failure should never be seen. This is an example of damage caused by mice. This damage can often be difficult to source. 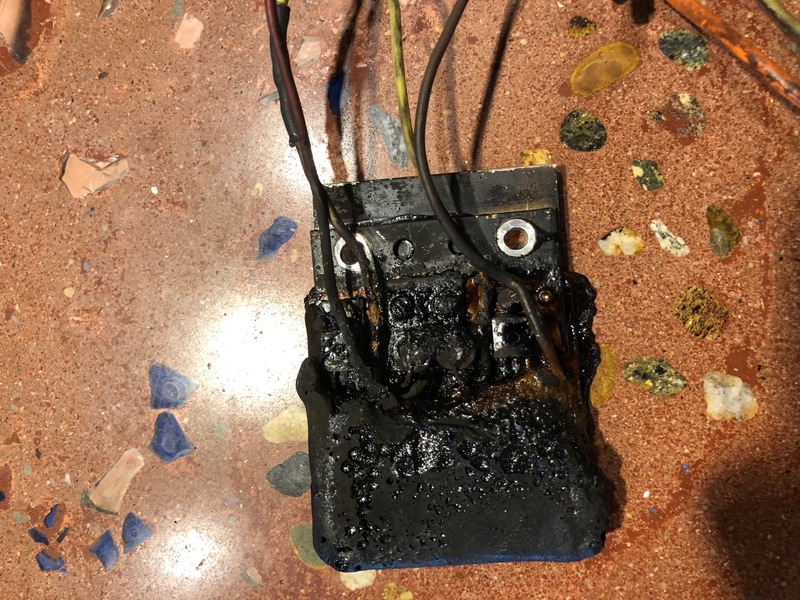 In this case it took several emails back and forth before the customer found the problem. Animals have been known to build nests in exhaust systems which often can also be hard to resolve. This can happen when you allow the fan machinery module to run after the foam vibration collars have packed down. Foam vibration support collars need to be replaced every 100 Hrs or less. Excessive salt water spray collects in the foam sealing the terminal block and cause a salt bridge. This leads to current leaking of disruption of engine electrics. Engine stops running. Company has a fix for this. Contact Neoteric for a specific advice or with any questions you may have. We would appreciate photos if you encounter this or any other issues with your hovercraft.